This bilingual board book edition of the all-time favorite follows The Very Hungry Caterpillar as it grows from egg to cocoon to beautiful butterfly. Great for teaching the days of the week, counting, colours, fruits and more. Striking pictures and cleverly die-cut pages offer interactive fun. 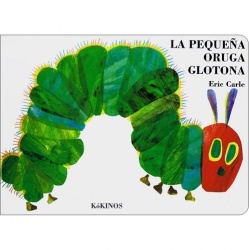 La oruga muy hambrienta / The Very Hungry Caterpillar has the full text in both Spanish and English. It is published in the USA and uses Latin American Spanish. The sturdy board book format makes it the perfect choice for babies and toddlers.